Having a team is great, but the payroll paperwork – not so great. Many business owners aren’t prepared for the extra administrative work that comes with having employees. The payroll tools in your Wave account will help you keep track of your employee’s hours, salaries, and tax deductions, and look after direct deposit. Add your employee(s) to Wave. Provide some basic information about your business. Create timesheets to track your employee’s hours. This is a step you only need to take once, when you first set things up. From your Payroll page, click the Get started with Payroll button. Wave will ask you to for your address and the number of employees you currently have. Once you have entered this information, click Save and continue. To get the ball rolling, Wave will ask you to enter information about just one employee, including their first and last name, address, date of hire and salary. If you have more than one employee, you’ll add the others later. Once you have entered this information, click Save and continue. Direct deposit for your employees is included in your Payroll fees at no additional charge. You’ll save time, and your employees will appreciate instant access to cash instead of having to go to the bank with a check and wait for it to clear. Since the approval process for direct deposit involves you, your bank, your employee’s bank, and Wave, the process can take 4-6 business days. So apply for direct deposit well before your next payroll date. If you don’t have enough time, you’ll want to issue checks for your first payroll, and then switch to direct deposit afterward. On your Payroll dashboard, in the direct deposit section, click Set it up. Review the terms of service and check “I agree to the Payroll by Wave Direct Deposit Terms of Service,” and click the Apply for Direct Deposit Now button. Wave will ask for your business information, including your business type, average monthly payroll cost, the date your business started, your address, your website and your phone number. If you’ve already shared any of this with Wave, it’ll already be filled out. Enter this information and click Save and Continue to Owner Information. Wave will ask for your personal information, including your first and last name, job title, Social Security number or Social Insurance number, date of birth and home address. Enter this information and click Save and Continue to Identity Verification. Why do we ask for these details? When we move money for our customers, Wave is legally obligated to collect certain information about the businesses using our services, in order to keep our services and our partners secure, and to combat fraud and money laundering. Information we collect includes details about your business (like the legal name of the business entity) and information about you personally (like Social Security number). This is an industry-standard obligation. Depending on where your business is based, Wave may ask you to answer some more questions to complete your application. Next, Wave needs to verify your identity with a piece of government-issued identification (such as a passport or driver’s license). Click Begin Verification to start. Wave will give you the option to take a picture of your ID using your webcam, or upload an existing image or scan of your ID. Click on either Use webcam to scan a document or Upload an existing document, depending on your preference. If you’re uploading an existing image, click Choose file and find the document. Click Continue to upload. Once your identity has been verified, Wave will ask you for your banking information, including your branch number, institution number, account number and account type. (If you don’t know where to find this information, don’t worry — Wave will show you.) Enter this information and click Save and Continue to Bank Connection. Click the Submit Application button. The Wave team will review your application, and you’ll hear back in 4-6 business days. How much will Payroll cost? This includes direct deposit to your employees, W2/W3and 1099-MISC generation at year-end as well as automatic tax payment reminders. If you're doing business in one of our tax service states (New York, California, Washington, Texas, Florida and Illinois), you will automatically opt into our Tax Service plan. If you wish to use our self-service option, however, you will be able to opt out of automatic tax services (should you choose to opt out, the full base fee of $35 will still apply). You can find out more about Tax Service here! You already added one employee when you first set Payroll up, but you can add as many as you like. From the Payroll page, click on the Employees section in the left navigation bar. From the Payroll page, click on the Timesheets tab in the left nav bar. Enter the hours of each employee (including overtime and vacation hours if applicable). Click Save. The amount you owe your employees will now show on the Payroll dashboard. There’s nothing extra you need to do for salaried employees! Wave will calculate how much you need to pay them each week. Wave will calculate what your workers have earned in that period based on the salary or hourly rate you’ve provided. Now you have a chance to review your payroll before you submit it. 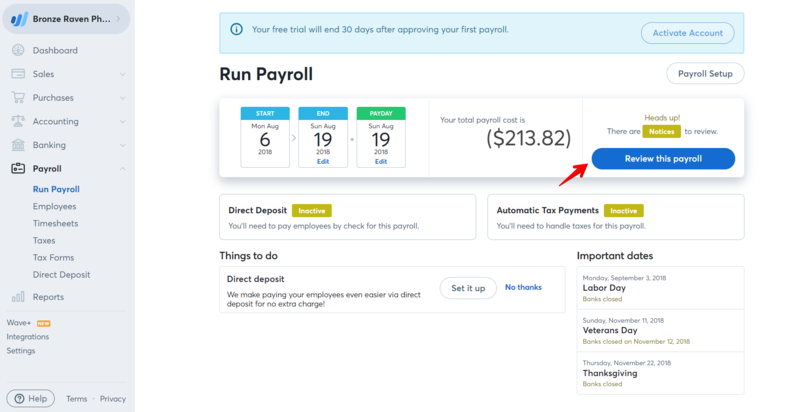 From the Run Payroll section, click the Review this payroll button. Wave will present you with the information you have entered, as well as all the details that Wave has automatically calculated, like tax deductions. If you aren’t using direct deposit, Wave will present the total earnings for each employee over the payroll period and remind you to write a check. When you’re ready, click Approve this payroll. If direct deposit has been set up, the money will be deposited into the employee’s account in 3-4 business days. Payroll also lets you create a tax profile and generate tax reports. The information Wave needs for these reports depends on your location, but it’s easy to find out: Just click on Settings at the bottom of the left nav and then click on Tax Profile. Wave will then tell you what information to enter. To generate a report, click on Wage & Tax Report in the Reports Section of the left Nav. Choose the time period you want a report for and click Generate Report. If you’re in California, Florida New York or Texas, you can also sign up for automatic tax payments and filing. Your W2 and W3 reports will be automatically generated with guaranteed accuracy.